Today is the last day of work at the National Library for Kristy Fox an esteemed contributor to this blog. Kristy is moving to Melbourne to work at Ebook Library, a vendor providing ebooks to academic, research, government and corporate libraries. See their brochure. We do hope that the National Library finds its way, in the mean time, its former librarians wherever they work, will continue to better promote the core aims of librarianship elsewhere. Congratulations to Alex Byrne, the new State Librarian of NSW, formerly of UTS. Dr Byrne has been a voice for librarians in matters of intellectual freedom and opposing censorship for many years, and served as IFLA President, his appointment is most welcome. We can also be thankful that the position has gone to a librarian. The Copyright Agency Limited (CAL) have released the results from its survey of members’ views of digital publishing trends – surprise ‘both authors and publishers think the benefits of digital publishing far outweigh any of the downsides’ – less of a surprise was that most Australian publishers still had no strategies for digital publishing. Disclaimer - I am a member of CAL, they send me money. 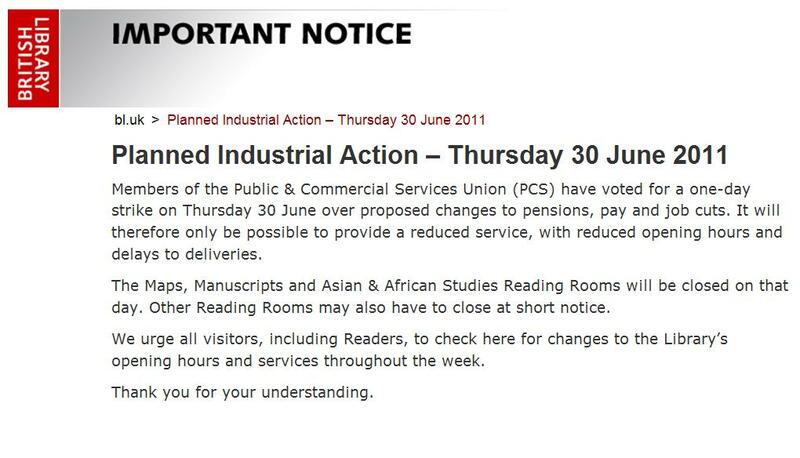 Last night via it’s twitterfeed the British Library announced that, due to strike action as voted by its union members, it’s ‘Maps, Manuscripts and Asian & African Studies Reading Rooms’ will be closed and that other reading rooms may also be closed at short notice. Unfortunately this is not the first time such radical action has been undertaken, with reading rooms closed back in 1999 and 2002. Closed reading rooms have the potential to have a great impact on the library’s users. It has been surprising to see that this tweet barely made a plonk in the social media ocean… why are people not talking about this issue? If industrial action does not get the attention of library lovers everywhere – what will? Wonderful post at http://jambina.com/blog/the-talk-i-meant-to-give/ read it all. as a librarian if you are not supporting the open access movement, ask yourself if you really believe that access to information is a human right. ACT Chief Minister Katy Gallagher, will make public access to information the default position of her Government as the first step in increasing openness of Government. Measures include release of a weekly summary of Cabinet issues and decisions and creation of an Open Government Website, which will be used to release government background reports and reviews; provide public access to material released through Freedom of Information; and access to submissions made during public consultation. One of the authors of this blog, Kristy Fox, interviewed by the Canberra Times on the National Library of Australia’s Mills & Boon collection.